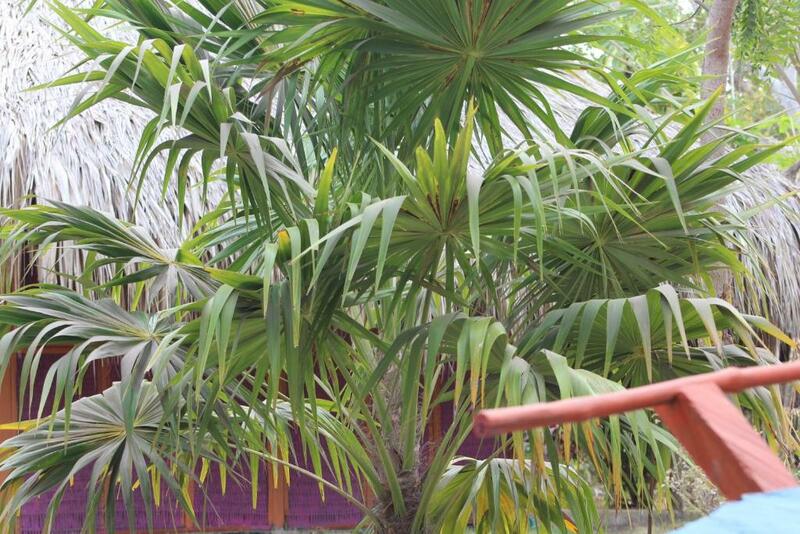 Lock in a great price for Eco Hotel Las Palmeras – rated 8.1 by recent guests! The location and price point were exactly what we were looking for. Staff were incredibly friendly and accommodating. We're ooking forward to our next visit! 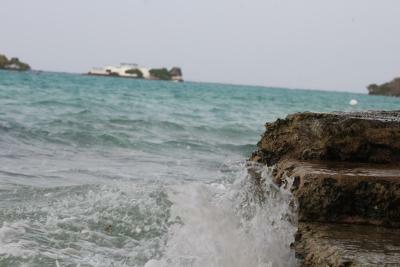 My favorite beach was Playa Cristal. Ask locals and they may send you in the right direction. Getting away from the city was nice for a night. 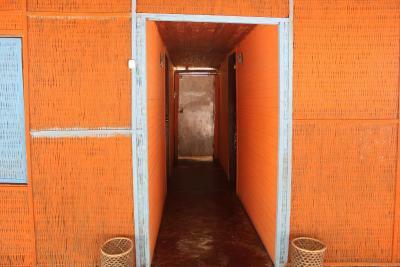 The rooms were clean, beds were clean and everything was as expected. 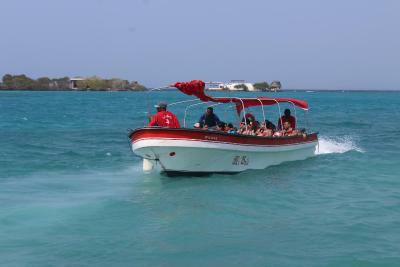 I liked the staff, location and the information of how and where to get correct boat tickets to Isla Grande. Living quarters were cleaned up and tided daily! Food was delish and fresh. Beautiful and tranquil, and every worker is so friendly and helpful! It’s a quick walk to the beach. All the food was traditional and delicious. 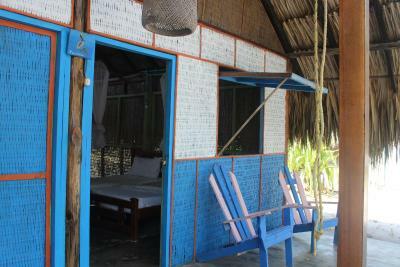 We loved the thatched roof huts and the fact the property is located in the middle of nowhere. There is also solar, so we didn't have loud generator noise (also there was some from neighboring properties). 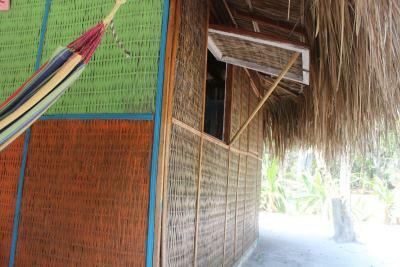 Every hut had hammocks and we spent a lot of time in them! Older reviews said there was no running water, but there is now, so that was nice too. We did not have to use a bucket and pail to shower. 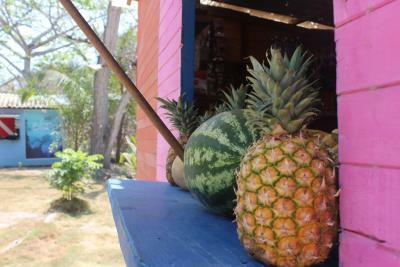 There is a small store on the property where you can buy a delicious roll and fruit, plus snack food. The plankton tour was great, although you can just walk to the plankton cove and swim off the old dock. 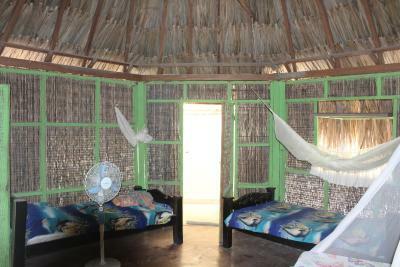 Wonderful eco hostel mins away from Playa Libre. 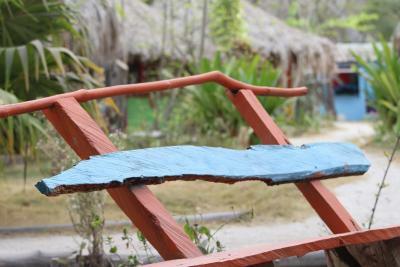 Wandering around Isla Grande is a dream. The staff at Las Palmeras isn’t always around but if you’ve scheduled something with them, they’ll be there right on time. 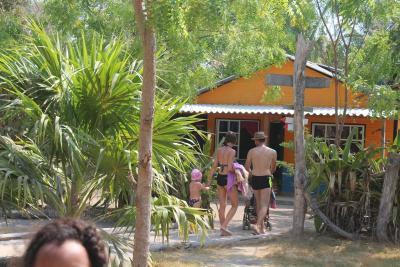 Great tours like snorkeling, biolumencent plankton, and bike tours offered through the hostel. 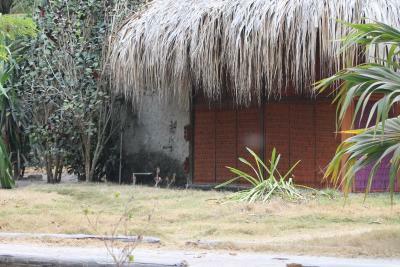 I was surprised to find that the Eco-Hotel Las Palmeras just added a new shower and toilet system for all of the rooms. Ana Rosa, the owner, is a dream! She makes your feel right at home. 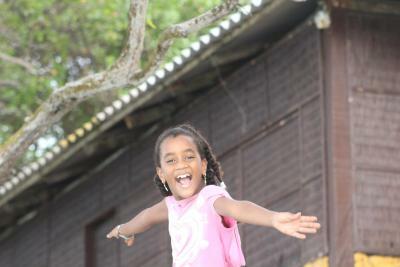 One of our best sellers in Isla Grande! 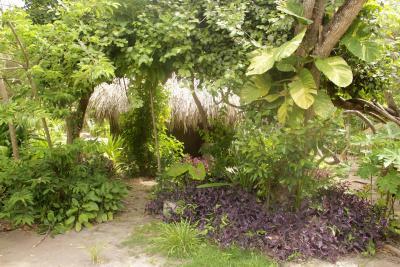 Offering a garden, Eco Hotel Las Palmeras has accommodations in Isla Grande. An American breakfast is available each morning at the property. 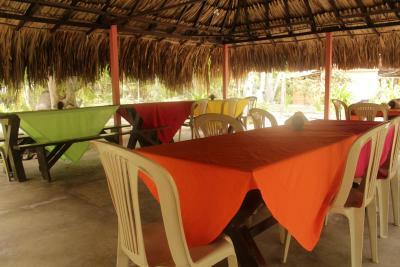 Guests can enjoy a meal at the in-house restaurant, which specializes in Local cuisine. 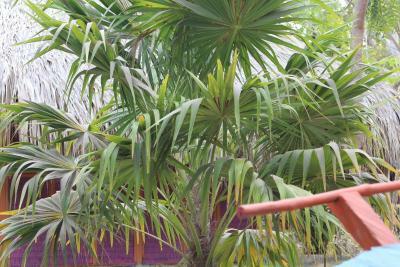 The lodge has a terrace. 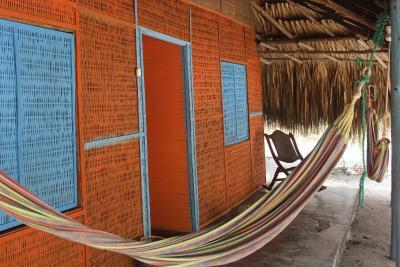 Cartagena de Indias is 26 miles from Eco Hotel Las Palmeras. Rafael Núñez International Airport is 28 miles from the property. 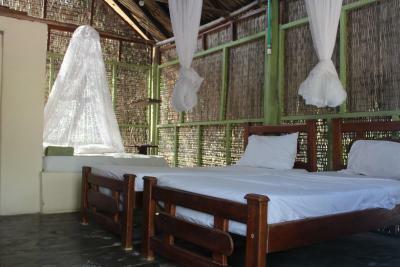 When would you like to stay at Eco Hotel Las Palmeras? 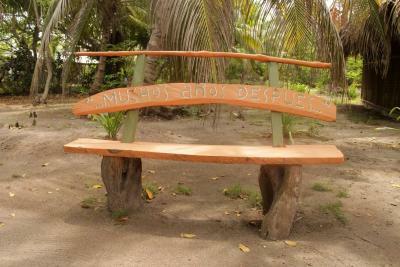 House Rules Eco Hotel Las Palmeras takes special requests – add in the next step! Eco Hotel Las Palmeras accepts these cards and reserves the right to temporarily hold an amount prior to arrival. I did not think the staff was very cool at all. I felt like they were more "annoyed" that we were even there. Not friendly, not welcoming and felt as though they were irritated that we were even there. 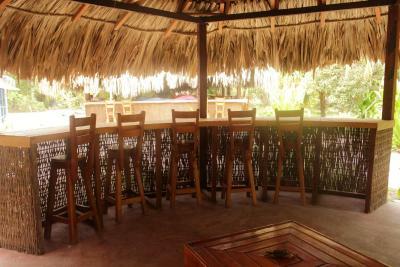 When we fist arrived, they were all behind the bar area. Didn't even say "hello" or anything. We had to ask them how to check in and everything. 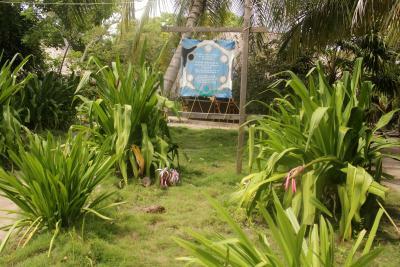 Went to another place on the island and staff was welcoming, friendly and very nice. Nobody speaks English. The stuff is kind of numb, not really caring. Food only at designated times. Toilets didnt flush for about a day. The whole island is kinda worn off. The staff could have been more friendly. I get that they don't enjoy dealing with tourists that don't speak Spanish but I speak a bit and the response I got was not friendly, except from the guy organizing the tours (Jose I believe). 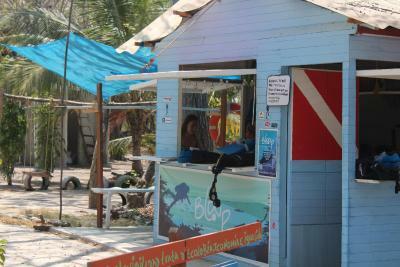 Oh and the guy that owns the dive shop - he speaks some English and is also really friendly. And breakfast took forever. I felt like all the tables were just dying for a cup of coffee but he didn't serve that until people started to get food and even then one large thermos was set down for a table of two. We just all started sharing coffee and I think he was a bit surprised. Staff was standoffish, value for the money was far less than expected, knowing who to talk to was difficult and the food was dreadful. I got food poisoning from the pork. 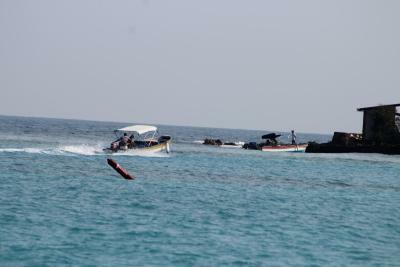 The staff seemed as if they did not want to help. At one point we waited over 2 hours to rent bikes when they had been sitting there all along. No one was willing to show us where they were and kept giving us the run around. When questions were asked, even in Spanish, I got a few eye rolls from multiple staff members. It was as if I was bothering them when they were sitting around the bar laughing and talking. We stayed there for a week. It was the last week of our long travel. We truly enjoyed this place. 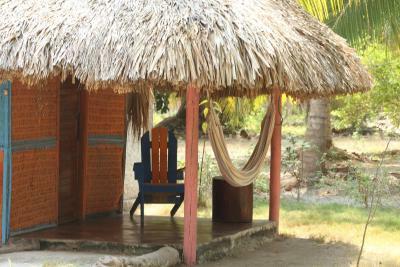 It is very rustic and basic, but what else you need on an island like this. 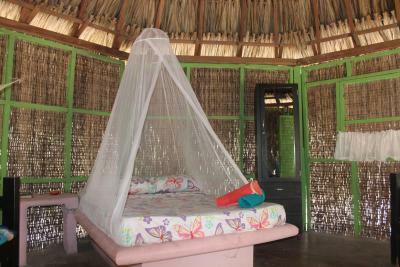 There was a clean water for shower, the bed is comfy and there was a mosquito net. 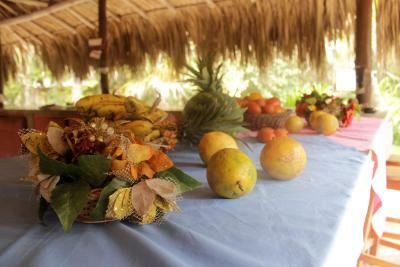 The food is pretty basic too, and it can get bit boring after a week, but there is plenty of fruit and veg to buy and top up your meal. 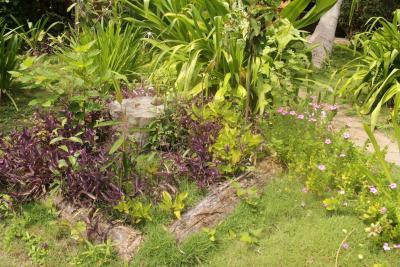 You can always look for more variety at the resorts and pay bit more. 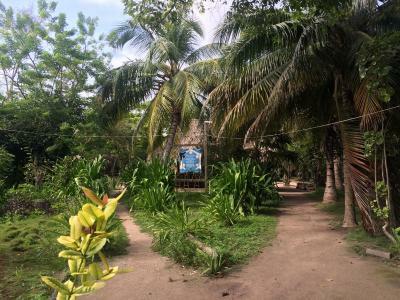 The island is wonderful, only paths to walk around, and get to the next beach. 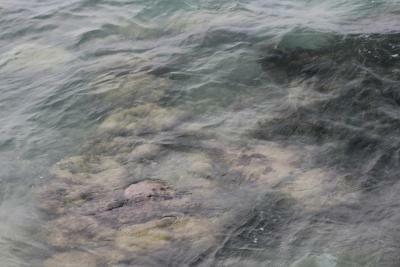 There are no huge beaches on this island, but the water is crystal clear. 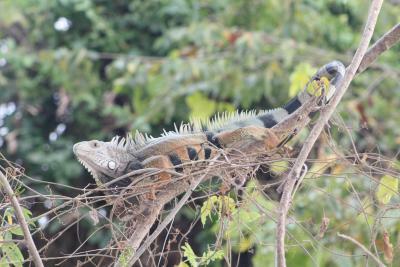 Isla Grande is still very much untouched. 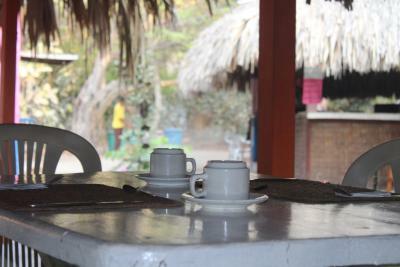 Our hostel also felt like a small community where all the guests eat together. We highly recommend it. Check your room / bed for spiders ect, because this is the jungle! 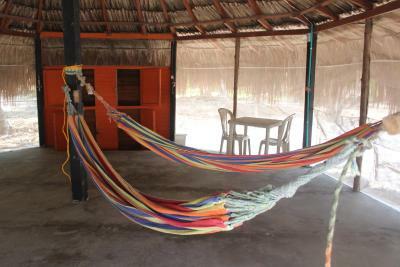 Great relax and natural place to stay. 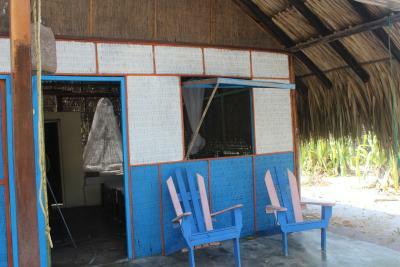 This is an ecohostel, so everything works on solar power, really cool. 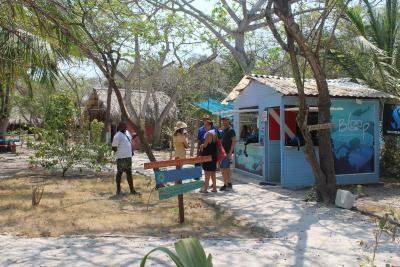 The staff is friendly ans they offer many tours on the island. 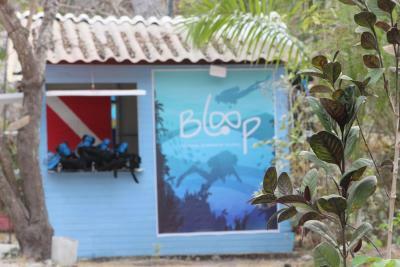 There even is a diving centre on the property! We stayed in the 2-person "room", really nice cabin what felt like our little house. The bed was really uncomfortable. 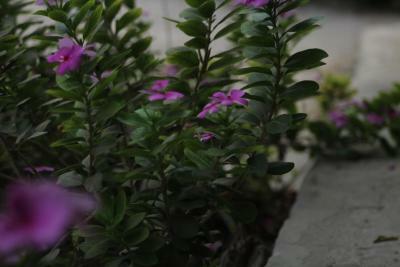 I was eaten alive by the mosquitoes. No choice for dinner or breakfast you got what they gave. Staff wasn't friendly. 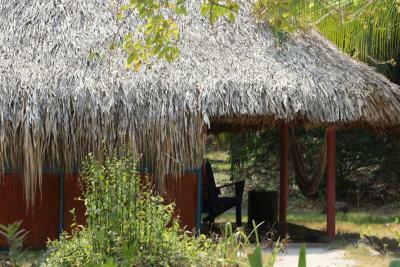 I didn't really see any sustainable practices here - just a grass hut on an island. Decent location between the two major resorts. The food was great although maybe a little more variety needed if you’re staying more than a few days! The staff at Las Palmeras are all so friendly and will help you with anything. 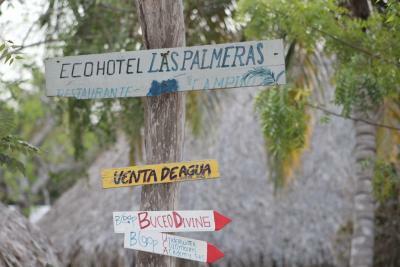 The tour to the Enchanted Lagoon, canoeing through the mangroves and snorkelling were so much fun (all arranged by the staff and apparently cheaper than the other hotels nearby). The meals are amazing value for money and we had a great few days here. 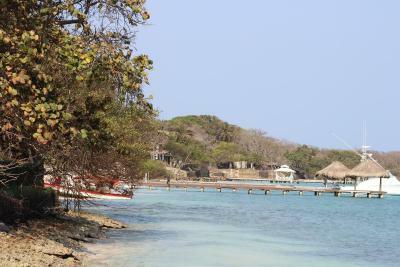 Ignore the negative reviews about Isla Grande, it’s lovely! 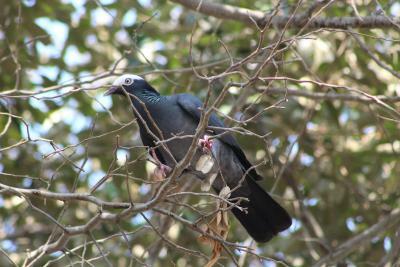 It is noisy, but that is okay as long as you don’t expect to sleep in, and you can take naps during the day. The booking and payment (or lack there of) process through booking.com is unclear because on booking.com it says you’ve paid half the total, but your credit card is not charged. There were a few people who had the same challenge and frustrations when using booking.com. Lack of WiFi, where’s other properties had their own WiFi, which was unavailable to non guests. 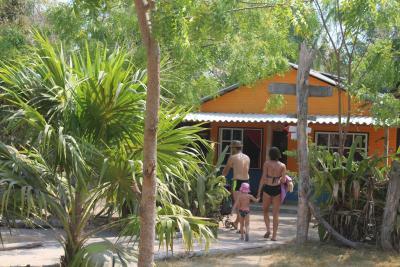 Lovely ECO property with big huts and showers in tranquil surroundings. Nice selections of breakfasts with fruit, Juice and coffee. 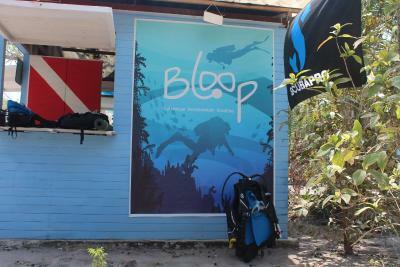 Bloop diving company are onsite and are a very friendly, helpful couple. 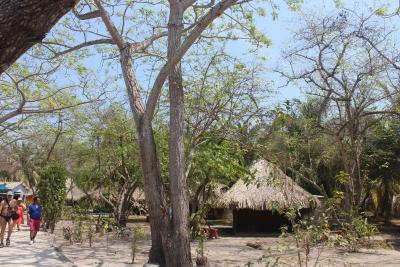 The property is close to the main beach which is small, but very nice, with great views of the other islands. 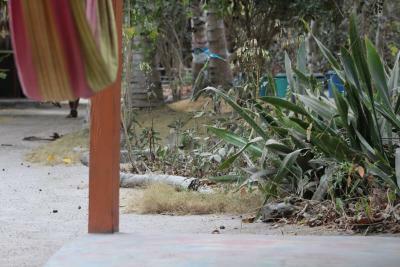 I really enjoyed my stay at Las palmeras. 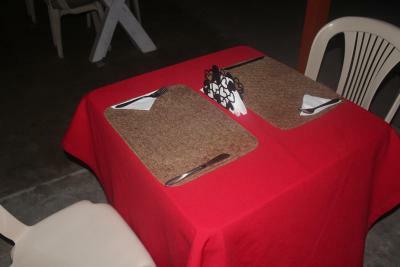 It was a nice atmosphere and the staff was always friendly, the food was also really good. I would definitely go there again.